My friend Mel once commented that I show people I love them by feeding them. And that’s absolutely true. I love giving food away, and I love putting in effort to tailor it to people’s individual tastes. =) So this year, I made sauces to give away at Christmas! First up, the easiest Raspberry Jam ever! Sterilize your jars how you wish. I wash them thoroughly in hot water, before placing them on a tray in a cold oven and setting the oven to 110C (without fan). Soften the raspberries in a large pot over low heat, stirring occasionally. Meanwhile, put four little saucers in the freezer. Once the berries get going, add the lemon juice. Skim off any scum that comes up to the surface with a slotted spoon or a mesh skimmer. The jam will start to thicken after about 15 – 20 min and this is the point that you start testing for ‘wrinkling’. Take the pot briefly off the heat and spoon a tablespoonful of jam onto a frozen saucer. Place it back in the freezer for 30 sec. Take it out and run your finger through it. If the surface of the jam wrinkles and you can draw a clear line through it, then your jam is done!! Ladle very careful (it is VERY hot) into sterilized jars and seal. Leave to cool. 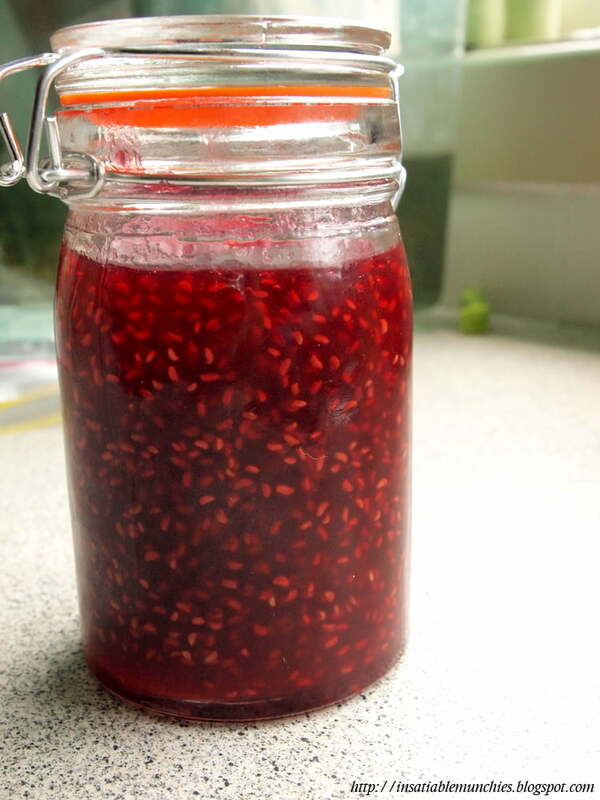 1.5 kg of berries yields slightly under 1kg of jam. Roughly chop up the tomatoes and place in a large pot. Place the vinegar in and cook over low-med heat, stirring occasionally. Meanwhile, place the cloves and the peppercorn in a piece of muslin and tie with string. Submerge this in the mixture in the pot. After the tomatoes start to soften, put the rest of the ingredients in and bring to the boil. Then simmer and reduce the sauce slightly. When you are happy with the taste of the sauce, take the spice pouch out. Keep reducing the sauce till you get a thick-ish, lumpy mixture. Take the pot off the heat. 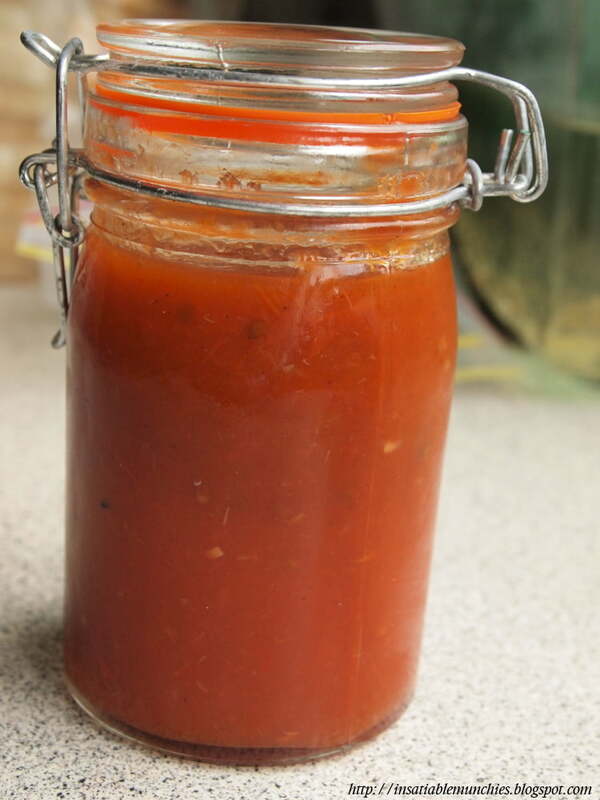 Many recipes now tell you to strain out the sauce, but why would you waste all that goodness??? I use a stick blender and carefully blend all the ingredients into a smooth sauce. Return to the heat bring back to the boil. Ladle into sterilized jars, seal and let cool overnight. Put all the ingredients into a pot (I used the remainder from my tomato sauce. The amount of each depends on your personal taste.) and reduce to desired consistency, stirring occasionally. 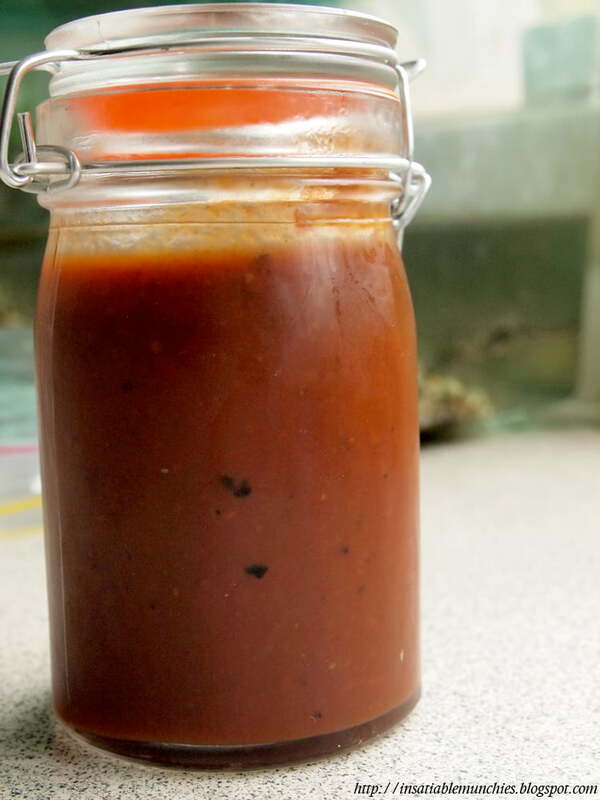 Ladle into sterilized jars, seal and let cool overnight. Merry (belated) Christmas everyone, and a happy new year!